Japanese theater director Yukio Ninagawa has produced a samurai version of Coriolanus in London. The original tragedy, by William Shakespeare, concerns the life of the Roman general Gaius Marcius Coriolanus, whose life story didn't need much in the way of dramatic license to be turned into a tragedy for the stage. The samurai version of Coriolanus, played by Toshiaki Karasawa, the "Alan Rickman of Japan," as director Ninagawa calls him. In real life, he's married to actress Tomoko Yamaguchi. ... by which I mean a tea infuser that is attractive and practical, not an infuser for cold tea. Crate&Barrel has a new type of tea infuser with a long handle and a silicone tip to insulate the user's hand from heat. The saucer-like base catches leaking tea between uses. For more tips on brewing green tea, click here. The long handle enables use with big, deep mugs of tea. And unlike the chain of some tea balls, you don't have to worry about the stiff handle sliding into your cup. In a boxing game users can throw punches or duck, and their movements are picked up by the phone's camera. In another game, the phone can be tilted in different directions to guide an on-screen ball through a maze. My theory is that this is a ploy to boost sales of cells phones—because all that punching, weaving, and swinging is going to get a lot of phones broken (including by irate recipients of accidental punches on crowded subway trains). Oh, and my apologies if upon clicking the above link you were subjected to one of those dancing-silhouette ads. Let's think of it as an opportunity to practice not letting things annoy us. A group of tricksters in Hokkaido imported a flock of sheep from Australia and England and passed them off as poodles. That's right—as poodles. In fact, thousands of them were sold, having been touted as the latest trendy pet. The scam began to unravel when actress Maiko Kawakami complained on TV that her new "poodle" wouldn't bark or eat dog food. 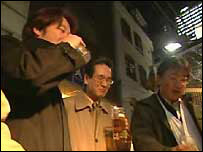 So far, there has been no word on whether any of the Hokkaido hucksters were caught. As for the sheep at the center of this unique bit of entrepreneurialism, many of them have reportedly been donated to zoos and farms. But I just can't help wondering: How many buyers still haven't figured it out? And how many of them did but decided to keep their sheep anyway? Ironically, these were probably the least annoying poodles in the history of dogdom. SELENE's objectives are twofold: to study the moon and catch up with China. Artist's conception of Japan's SELENE lunar orbiter. 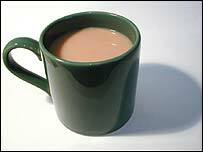 A study published in the European Journal of Cancer Prevention says that drinking tea may lower your risk of getting skin cancer. Just remember: Don't put milk in your green tea! Hokkaido Railway has developed a bus-streetcar hybrid that can travel on standard train rails, then switch to rubber tires for bus-like locomotion on the roads. It's a bus, it's a train, it's the Dual Mode Vehicle (DMV). The Kikuchi, Kumamoto, branch of the Japan Agriculture Association announced they are releasing a loose-leaf green tea product that blends green tea with hojicha (roasted green tea). I haven't tried JA's tea, but it is easy enough to create your own blend: Just put a pinch of Monk's Choice or Top Leaf Green Tea into your teapot or your permanent tea filter along with a pinch of our Hojicha and—voilà—there you are. It's fun to experiment with different blends of green teas. Give it a try. Also, notice I said a "pinch" of green tea. I was being intentionally vague: Brewing tea is an art, not a science, and teatime is a time for relaxation, not for stressing over exact amounts of tea or water, exact water temperature, or exact brewing time. Remember, grasshopper, the ultimate goal is to brew the perfect cup of tea—that is, your perfect cup of tea—instinctively and intuitively. The great Bruce Lee said about his fighting style, "I do not hit. It [his fist] hits all by itself." That's what a Mellow Monk tea master should strive for—the "all by itself" part, not the hitting part. His hand hit all by itself, but could it brew green tea all by itself? Back in January I posted a cocktail recipe for a Green Tea Ginger Hot Toddy. The hot toddy has been around for a while, and no doubt the Green Tea Ginger Hot Toddy is only one of countless variations of the drink. But what I didn't realize until recently is that the hot toddy was originally named for a famous Hollywood actress, Thelma Todd. Tragically, Thelma died in 1935 at the age of 30. One of the last people to see her alive was her ex-husband, reputed mobster Pat DiCicco. DiCicco, along with actor Wallace Beery, was also a suspect in the death of Ted Healy, the vaudevillian who in the mid-1920s worked with three young funnymen who would eventually find fame as the Three Stooges. Thelma Todd's death was ruled a suicide—a ruling that is still controversial today. Some even say that Thelma's ghost still haunts Hollywoood. Rain and wind had already swept away the blossoms, but the Washington, D.C.
Cherry Blossom Festival still gave people what mattered most: a good time. Oh, and for those of you who are really tuned in to popular culture, some guy named Ace Young lip-synched a song called "Scattered." Students from Japan's Tamagawa University perform at the National Cherry Blossom Parade in Washington, D.C., on Sunday. At last, a business philosophy I can get into: the art of what Steven Crawley calls strategic incompetence. The most memorable time he brandished his nonskill was when the president at an automotive-parts manufacturer asked Mr. Crawley to organize the company picnic. ... So he began to milk his lack of picnic knowledge for all it wasn't worth. He responded to any inquiries or suggestions with questions and comments such as "How do you do that?" or "What did you guys do in the past?" or even "Help me remember why we're talking about this." Ultimately, responsibility for the picnic was reassigned. Mission unaccomplished. Today is National Stress Awareness Day, and here are a few tips on stress reduction. But to any list of stress-reduction tips, don't forget to add "green tea." Brew some green tea and mellow out, dude. Since losing its last obstetrician five years ago, this city of nearly 32,000 in rural northern Japan has been desperately seeking a replacement. So desperately, in fact, that it recently promised a horse to any obstetrician willing to come here. There have been no takers yet. Actually, for the women who, after going into labor, have to drive 45 minutes to the nearest big city for medical care, this is no joke. Yukie Kikuchi, right, a midwife in Tono, examines Azusa Furudate, using a telemedicine system. Too much thinking about a problem can lead to paralysis. The centipede couldn't walk after the cockroach asked him what was the secret of moving all those legs so elegantly. Japan's Hinode ("sunrise" in Japanese) spacecraft, in orbit around Earth since last September, is taking some truly amazing images of the Sun. Hinode's images reveal unprecedented detail of the Sun's surface. Elizabeth Farrell, BellaOnline's "tea editor," answers the question Is bottled green tea really healthy? Ikuko Juryo is an old-fashioned matchmaker in Fukui Prefecture, Japan, who really hits the bricks to bring young people together. Possibly because of Ikuko and women like her, Fukui was the only one of Japan's 47 prefectures to raise its birthrate in 2005. One of the cardiovascular dangers posed by diabetes is stiffening of heart muscle tissue (myocardium) resulting from increased amounts of myocardial collagen, among other factors. However, a study published recently in the journal Pharmacological Research shows that green tea reduces the harmful end products of excessive myocardial collagen and so "may provide a therapeutic option in the treatment of cardiovascular complications of diabetes." Funerals are not the cheeriest of topics, so please forgive me, but I found this article a fascinating glimpse into how fundamental changes in Japanese society are driving changes in tradition. An exercise physiologist at Eastern Washington University dispells several common myths about nutrition, such as eating eggs raises your cholesterol and eating carbohydrates makes you fat. After seeing the Snapple commercial, promoting its "new green tea with the most EGCG on Earth," and reading about Coca-Cola's new green tea drink with EGCG content that creates "negative calories," my inquiring mind wanted to know, what exactly is EGCG, and what can it do for me? However, despite all the what-ifs, I'm still a little bit sold on EGCG's advantages. I'm not going to go out and spend the over four dollars it would take to get the right amount from Enviga... But I might substitute my usual mocha for a piping hot green tea. You are wise beyond your years, grasshopper. To pick a model to star in TV commercials for a new green tea beverage, Coca Cola Korea conducted a survey that asked over two thousands households in the Seoul area which celebrity best fit the image of "detoxification". Sounds like a strange question, until you read that Coca Cola is promoting the new drink, whose name translates as "Everyday Green Tea," as a way for to "purge oneself of stress and the toxins people absorb in modern urban life." The winner of the survey? Han Ye-seul, otherwise known as Leslie Kim, shown below. Han Ye-seul, a.k.a. Leslie Kim. I only saw six headings in this list, but on closer inspection, there's another reason tucked into the first paragraph. The Japanese comedy group Rahmenz previously brought us the satiric short on how to eat at a sushi restaurant. Now comes another entry in their Japanese Tradition series: The Japanese Tradition: Chopsticks. Kudos to the Youtube user "gameday" for adding English subtitles. Like most folks who take over a family business from their parents, Kyo and Manabu Fujimoto decided to do things a little differently than Mom and Dad. On the family farm in Tsuyama City, Japan, the twentysomething brothers made a slight change inside the greenhouses where they grow shiitake mushrooms: They installed speakers and started playing loud, thumping dancehall-style reggae music. This decidedly modern approach to shiitake cultivation has made them locally famous (or notorious, depending on taste in music). Initially, the brothers began playing the music simply because they liked it but soon began noticing that their shiitake were growing larger and thicker. They also claim this technique is backed up by research showing that mushrooms thrive when exposed to low-frequency sounds (such as the bass line in reggae). So remember, gang—it's classical music for plants, reggae for mushrooms. The National Cancer Institute, part of the National Institutes of Health, has a fact sheet on tea and cancer prevention. It includes a summary of clinical investigations into green tea done thus far. The Nihoncha [Japanese Tea] Instructor Association (website in Japanese only) is in the business of certifying Japanese tea instructors and tea advisors (depending on which test is taken). Those who pass the test are also called "sammeliers," a play on words combining "sa" for tea (茶, also pronounced "cha") and "sommelier," the French word for wine steward. According to the NIA's website, over three thousand instructors and advisors have been certified throughout Japan. These "green tea stewards" ply their trade at restaurants, inns, trade shows and other events. Tea sommeliers are also in demand at schools, where they teach children the art of preparing the perfect cup of tea. Not that making tea is that complicated—it's just that even in Japan, a lot of kids nowadays think of green tea as something that comes in a bottle from a vending machine.